QUEENS — The opening of the long-awaited new entrance to the Briarwood-Van Wyck F train station is at least three months overdue, adding to locals' growing frustration over the lengthy construction. The project, which started in 2010, has created significant problems in Briarwood along Queens Boulevard, disrupting traffic patterns and making sidewalks inaccessible, residents said. The new subway entrance, on Queens Boulevard and Main Street, was scheduled to open this past fall, but the project ran into a number of obstacles. The opening is now scheduled for March, state DOT spokesman Beau Duffy said in an email. "The delay was caused by the discovery of lead paint in the existing tunnel," Duffy wrote. "It had to be removed prior to construction." 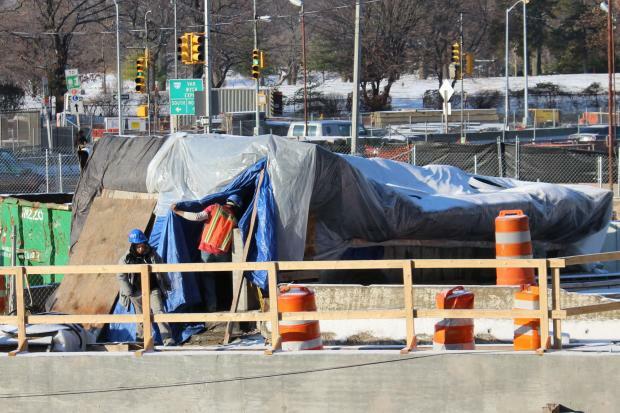 The new entrance, next to the Briarwood branch of the Queens Public Library, is being built as part of the Kew Gardens Interchange project, which will widen the Van Wyck Expressway and rebuild its bridges and ramps. The $147 million project "is about half done," Duffy said. Meanwhile, Briarwood residents have had to use the entrance located between the construction site and Maple Grove Cemetery, a long walk from the residential section of the neighborhood. Residents are tired of the yearslong construction along Queens Boulevard and the Van Wyck Expressway, Seymour Schwartz, president of the Briarwood Community Association said. "We are the ones who suffer most because we are right at Queens Boulevard and Main Street," he said. Anna Zaharova, 42, an office manager, said the project has been tough on her mother, who is 71. “It takes her at least 20 minutes to walk to the subway station now,” she said. “With the winter season, it’s very frustrating,” she said, adding that lane changes on Queens Boulevard have confused drivers and that the temporary path leading to the current subway entrance is poorly lit and feels unsafe.